We like to say that the camera doesn’t lie. But the reality it shows isn’t quite real either. The girl is suspended in time, frozen in a moment of exhilaration. On the picture, her hair blows in the wind and she has thrown her left arm up in delight. In trance, possibly. Something about the girl’s exposed back makes the photo look like a painting. The light on her shoulders is just too perfect, the way it falls down her back and emphasizes the creases in her dress. 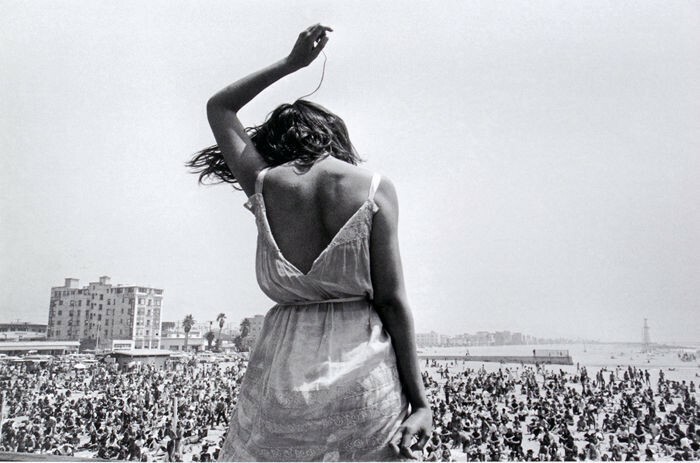 The girl in the photo is stuck in a moment in 1968, when photographer Dennis Stock took her photo at a rock concert. But what makes it so remarkable isn’t that she’s frozen. We have certainly seen that before. It is the way the photographer has isolated her in the picture. She is close to his camera, while the rest of the world, a busy crowd of concert-goers, has faded into the background. They’re frozen too, but we only see them sitting on a beach, waiting, unperturbed. None of them are celebrating like her. And so the girl looks like she doesn’t quite belong, as though someone had cut her out and glued her into this frame, like a collage. But of course nobody has. There’s a little ledge visible in the lower left corner of the picture, showing that she stands on some kind of platform. In fact, nothing about the picture is unrealistic: It’s just that the perspective and the framing is spot on, the exposure just right, the emotion perfectly captured. It’s the brevity of a moment made beautifully permanent in a picture that isn’t just realistic, but hyperrealistic. It seems odd. Our eyes are pretty powerful instruments. To speak in camera terms, the finest camera lens pales in comparison to our eyes’ color accuracy, low-light performance and rapid focus. But couple the camera lens with the ability to freeze time and you get what we consider artful. Cameras capture something hyperrealistic, something we can’t normally see. Our eyes move on too quickly. The world is in a process of becoming, remember? Susan Sontag had another name for hyperrealism: She called it surrealism. In her famous book “On Photography”, she writes “Surrealism lies at the heart of the photographic enterprise”. Since her book gets quoted way too often, I am going to spare you the rest of that paragraph. The point is that Sontag recognized the oddity of any given photo – because its realism wasn’t quite right. For it to be surreal, “manipulation is unnecessary, if not redundant”, she wrote. There, I quoted her again. We’re fond of saying that the camera doesn’t lie. As an inanimate object, it fundamentally has no agenda and produces representations as faithful as the technology allows. When photography was first invented, painters actually found it too realistic for art: They made a distinction between artistic and realistic representation, possibly to save their own jobs. For a while, the camera’s realism was considered vulgar, but in photography we’ve now accepted that reality, as captured by the camera, has become art. There’s still a paradox, though. As cameras get technically refined, photos become sharper, and our reality quite literally moves into focus, the resulting photos become more and more hyperrealistic. Their brilliance no longer mirrors our experience. You could understand that to mean that humans aren’t perfect. That despite of our great eyes, we’re fundamentally flawed observers, too busy living from one second to the next to really stop and capture something as vividly as the camera can. You could argue that our memory is too unreliable, that it takes the same artistic liberties as a painter does when we remember something. Or you could turn it all on its head and realize: The camera does lie.